Too big… – …STILL CRAZY AFTER ALL THESE YEARS! Come lunchtime every Saturday when my girl is home from her school in the jungle, I would be cracking my head as to where I would be able to take her to enjoy some really nice stuff before she goes back the following day. …located at one of the mega-malls in town, not far from my place. I prefer this outlet to the main one in town as parking is a breeze, ample spaces available, plus it is shaded so you would not need to go through that very unpleasant discomfort of getting into your extremely hot car after you have had a delightful lunch. However, I do not really like the fact that this place is always kind of dim/dark even in the daytime so the photographs taken with my cheap digicam may not do justice to the food served. …here before they closed shop to venture into the instant kampua business full-time and they did let somebody else sell it, like some kind of a franchise kind of thing, but it did not last very long and pretty soon, the stall closed down. Now, that was so so big, too big for the three of us. It may not look so in the photograph but that bowl is about the size of those that they use to serve the soup at a full-course Chinese dinner to a table of 10. 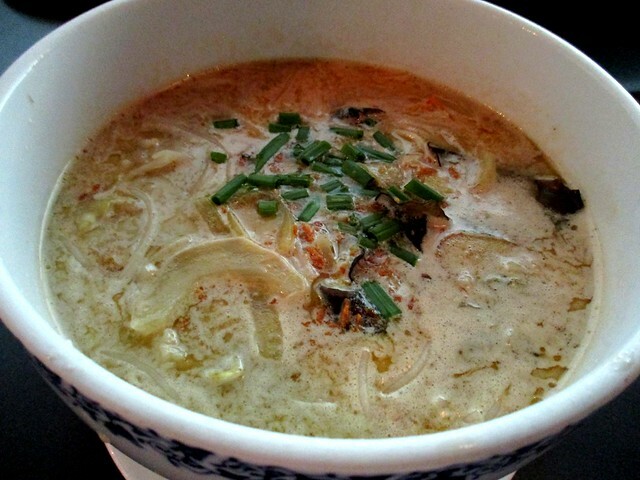 …each, we really could not handle much more so we had to leave a little less than half of what was in bowl behind. For one thing, one can just have so much of such so very creamy and rich stuff and may cease to enjoy it as much when one gets to eat a little bit too much at one go. I think the serving would be just nice for maybe 5 or 6 people. Now, I thought that was cheap because a couple of weeks ago, I bought a piece that was more or less the same size, also Norwegian and not the farmed Chile ones, from the supermarket near my house for my girl to enjoy and I had to pay that much as well…and I was so pissed off when I got home and discovered that they had removed the skin!!! That would be where the collagen is and some places actually sell fried salmon skin on its own. My girl loves salmon and yes, she liked the one we had that day, perfectly grilled right down to the crispy skin underneath and she thought the lemon butter sauce was really good and went absolutely well with the fish and the potato tuna salad by the side was really very good too…so of course, seeing how she was enjoying the food to the max, that made me very very happy. Well, my girl will be home today as tomorrow, Good Friday, is a public holiday in Sarawak (but it is a day of fasting and abstinence for us) and the school is taking Easter Monday off so we have an extra long weekend to jalan jalan cari makan (go around and eat). 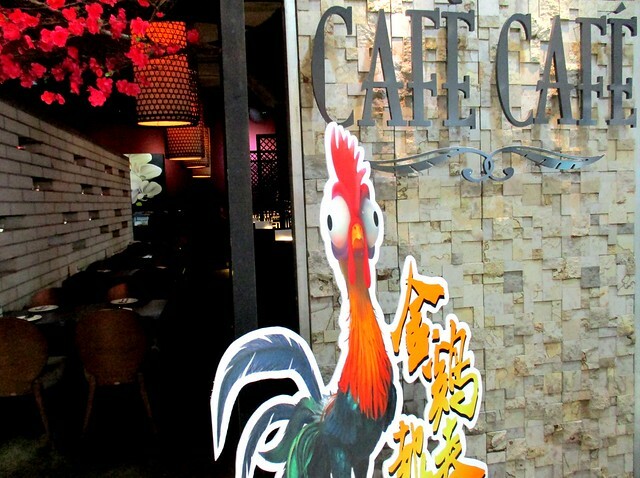 CAFE CAFE, Giant Hypermart outlet (2.325540, 111.853538), is located on the ground floor of the mega mall located to the left of SMK Bandar Sibu along Jalan Ling Kai Cheng. I guess you did not know that the portion would be so much or else you would have only ordered the fish noodle for the 3 of you and go back again for the salmon on another week. I like both the dishes very much as I like to eat fish and salmon. Enjoy the long weekend with Melissa! Have a blessed weekend. It just did not cross my mind at that point in time. I do know, for a fact, that they serve HUGE potions here – I often saw big groups of young girls ordering one dish and sharing while chatting away so loudly and spending their time on their smartphones, enjoying the free wifi. 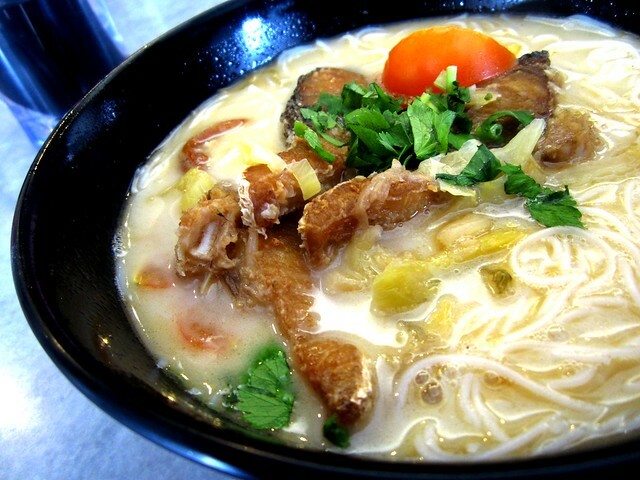 We would love to go back again for the salmon – the fish noodles was nice but too rich and too much, enough for quite a while, I guess, and we would not want to just eat that alone. I like natural daylight for my photos too. I try to avoid visiting restaurants in the evenings for this one reason (and, also because I’m not a night owl – more of an early riser). Oh? You sound exactly like me and they say that’s old age! Duhhhh!!!! I guess I am but you’re definitely not. 😀 Natural daylight sure makes the photos look a whole lot nicer – I never use flash, very unnatural, not nice at all. I love salmon especially its crispy skin when it is grilled. Hmm. 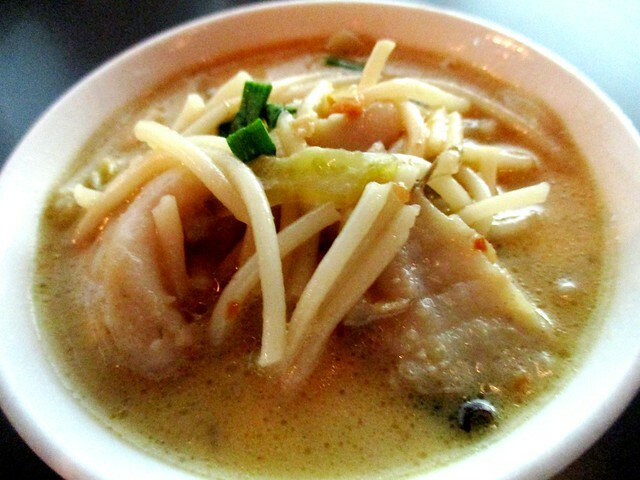 I still prefer the fish mihun in clear broth than the creamy milky broth. I just had it last week with my mum. The creamy one is popular in places in the peninsula, it seems, like around KL. We can’t get that here so it was good for a change. The clear soup ones, we can get at a lot of places. The salmon was good and it was Norwegian, not Chile. It did not have that strong smell that I find sometimes in salmon, too fat perhaps. Never like the smell though my girl seems ok with it, as long as it’s salmon. Singapore people very hardworking, very few holidays. 😀 Here, only in East Malaysia, Sarawak and Sabah only, other states no holiday, not even on Good Friday. My school days, colonial time, Easter Monday was a holiday. 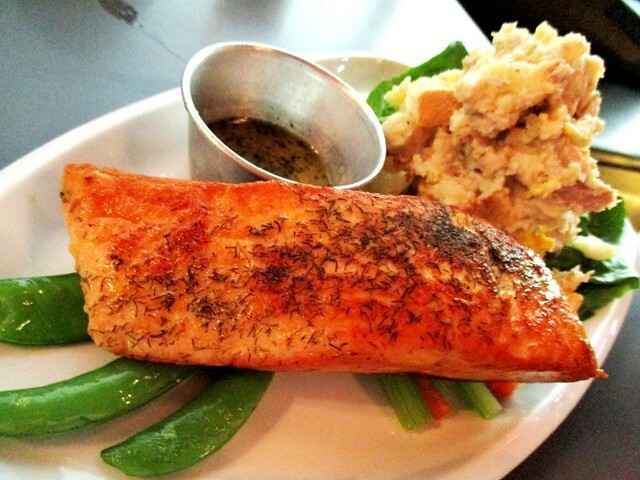 The grilled salmon is something I would love! It was nicely done, just right. Some spoil it by overcooking till there is a somewhat hard outer layer, not so nice. Anything too creamy, rich or cheesy can make one geli after taking too much. So far, the creamy fish bihun which I had in Shah Alam is very nice, not overly creamy. Hearsay there is a new outlet at Best Corner, Stutong area (formerly 98 kopitiam) selling this fish bihun but I have yet to try. Hope to drop by soon. Thanks. Enjoy yours too, tomorrow. Oh, I thought they served the fish bihun in individual portions. Not here, one giant bowl and you serve yourself. 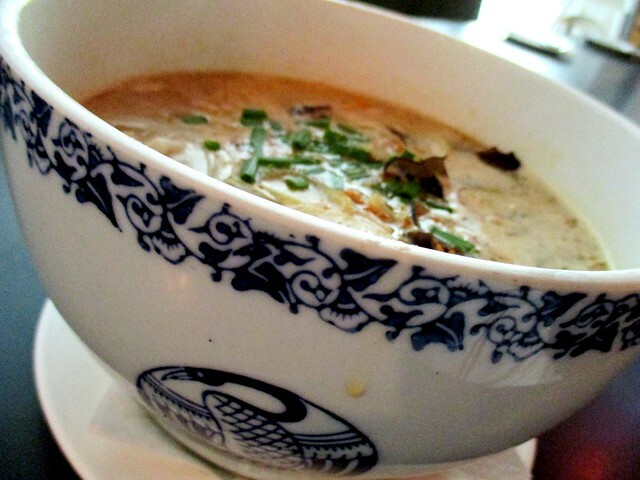 A little bit more of the salted vegetables would be good – could hardly taste it though there was a bit in the soup. Pingback: Nice lunch… – …STILL CRAZY AFTER ALL THESE YEARS! Pingback: Whatever your heart desires… – …STILL CRAZY AFTER ALL THESE YEARS! Pingback: Perfect picture… – …STILL CRAZY AFTER ALL THESE YEARS! Pingback: Moved… – …STILL CRAZY AFTER ALL THESE YEARS!